House members can view rooms in 3D to get realistic views of the suites. AOC staff have built an enterprise GIS portal that gives colleagues access to needed data. GIS is now the hub for all the AOC’s automated systems. The United States Capitol and its grounds are maintained by its own architect—the Architect of the Capitol (AOC). The US Capitol and Visitor Center, Senate and House office buildings, Supreme Court, and Library of Congress—17.4 million square feet of buildings—are cared for by nearly 2,600 AOC staff. They also are responsible for keeping the more than 460 acres of Capitol grounds in impeccable condition. This isn’t easy when you consider that members of congress, their staffs, and approximately two million visitors come through the US Capitol Building each year. 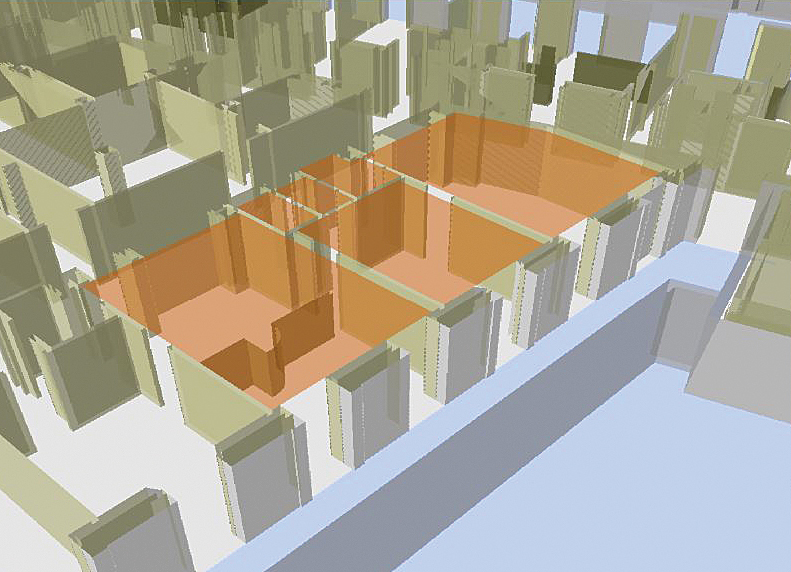 The user can view a room in 3D using actual partition heights that are stored in ArcGIS to get a much more realistic view of the suite. When it comes to providing excellent client service, one of AOC’s important duties is helping members of the House of Representatives select the location of their offices after each election. Every two years, 435 members of the House go through a highly organized process to select their office suites. Based on their seniority, House members draw lottery numbers and then are ushered into a room to choose from a subset of rooms that are available to them. 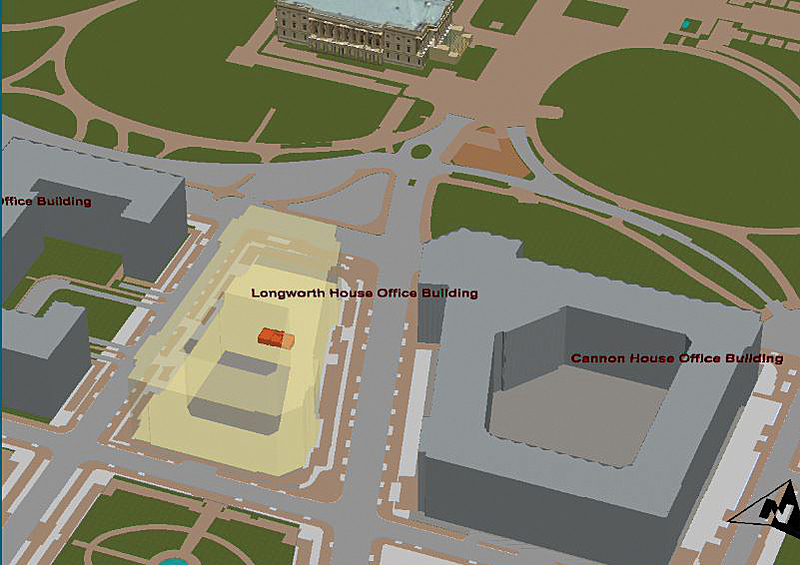 During the November 2012 transition, however—the 113th time the House has been elected into office—instead of selecting office space from paper maps and photographs, members were presented with an interactive map app that provided access to photos; complete information on the suites, such as window views, access to elevators, and committee hearing rooms; and even a 360° panoramic view of the available offices. AOC staff had been in the midst of transferring paper architectural drawings and floor plans into digital files when an idea struck them. With the office lottery fast approaching, since the drawings were being stored in a new server so AOC staff could access the files, why not create a congressional move application at the same time? The app was ready in time for the AOC to use during the House’s postelection transition. To get started, the representatives and/or representatives-elect and their staffs sat down with an AOC professional staffer and opened the app to view the variety of office options available to them. Making things even easier, the app was designed to be used on iOS devices, which has become a standard smart device used by AOC staff. By just typing in an office number and tapping a button, a view of the suite’s location pops up on a 2D map. The viewer also offers a 3D image of the building. Suite view in government campus context. The user can also hover over or touch an object on the screen to get additional information about it. For example, if an office contains a room-dividing partition, the user can tap the partition to see if it is ceiling height or not—something that was impossible to do before the app was developed. In years past, the clients would have to visit each office suite if there was a question about its configuration—which was difficult to do in the short amount of time they’re allowed to select a suite. Now, the user can view the room in 3D using actual partition heights that are stored in the GIS to get a much more realistic view of the suite. AOC took this new concept and embraced it—GIS is now the hub for all AOC’s automated systems. When it was first introduced in 2007, it was through simple visualization of data on computer desktops. Today, AOC staff have built an enterprise GIS portal that gives all their colleagues access to the data they need. This platform allows them to support a large number of users, very large datasets, and graphic-intensive processes. The system they built to handle this is substantial, and several computer drawing staff personnel worked for three months to get the data into the system. There was a heavy investment of time in the beginning to get the drawing files into shape. The drawings had to be cleaned up, the polygons were closed, standard text blocks were created, and the drawings were all labeled in a conventional manner to make them more useful. As the fundamental data gets into better shape, the time staff spend on data conversion will decrease. A full-time GIS analyst keeps the developed apps up and running and slowly introduces new functionality. There are master drawings of the campus that are kept on file and changed as construction happens, which is almost every day. Smith’s team receives the as-built drawings, quality checks them, reflects the changes on the master drawings, and then updates the rest of the drawings on a monthly cycle. After this update, the information is updated on the map services. For more information, contact Christopher Smith, director, Technical Support Division, Planning and Project Management, Architect of the Capitol (tel. : 202-226-4711).